SG Toto v2 – Updated after 1 year! SG Toto has been updated to version 2, after a long 1 year! The last update (version 1.0.8) was 1 year ago, and it was just a minor fix. In fact, nothing much has changed since it was released 2 years ago, in Nov 2008. The fundamental changes are similar to version 2 of SG 4D. And if you are interested in the technical aspects, you can read here. 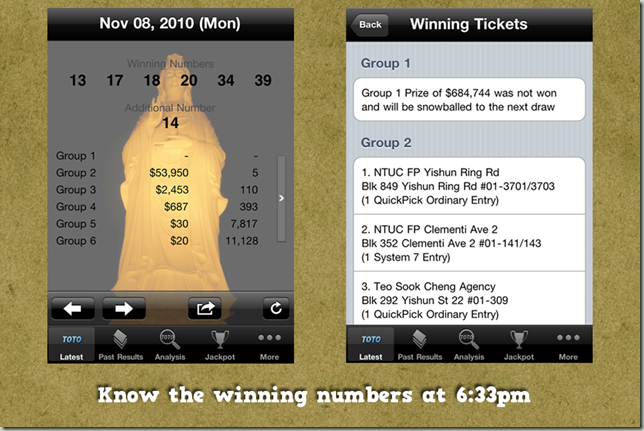 You now get results faster, approximately at 6.33pm when the numbers are drawn! 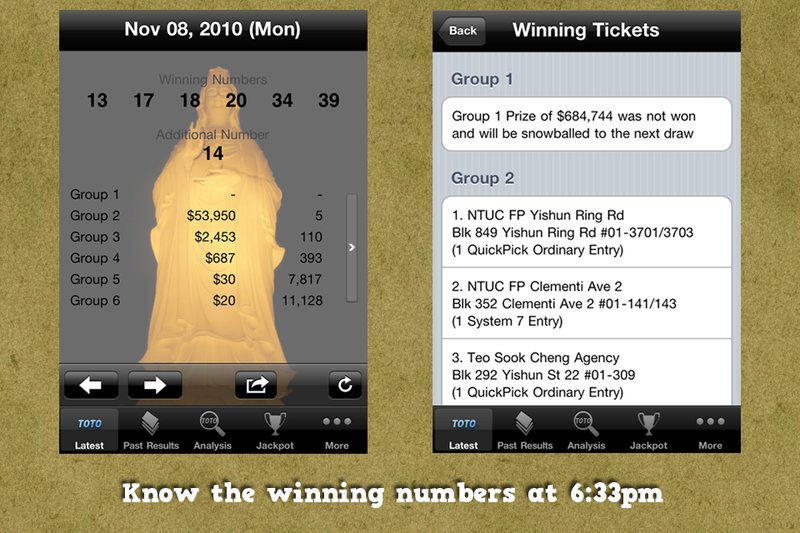 You also will get push notification once all numbers are drawn (locked feature). Furthermore, the app now provides the winning tickets information. Now you know where the lucky outlets are! 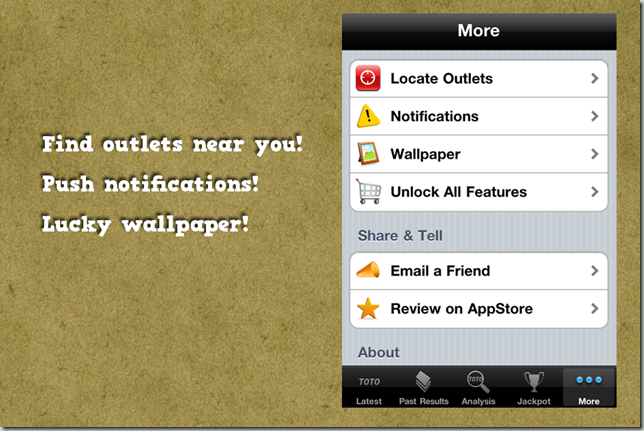 And under More > Outlets, you can easily find the outlets and how to go there! We know you are interested to know what is the result 1 year ago, 2 years ago, on your birthday, Michael Jackson’s birthday, … or 24 years ago! As such, we provide you the entire history of Toto. To help you further in the game, we are providing more thorough number analysis! This is a much sought after feature, and we will provide more different kind of analytics in the future. Check what numbers are not drawn in the last X draws. This is similar to what Singapore Pools provides, but with no restrictions on the number of draws to analyze on. Frequency Table shows you how many times a number has been drawn, sorted from highest frequency to lowest. With that, you know what are the hot numbers to buy! 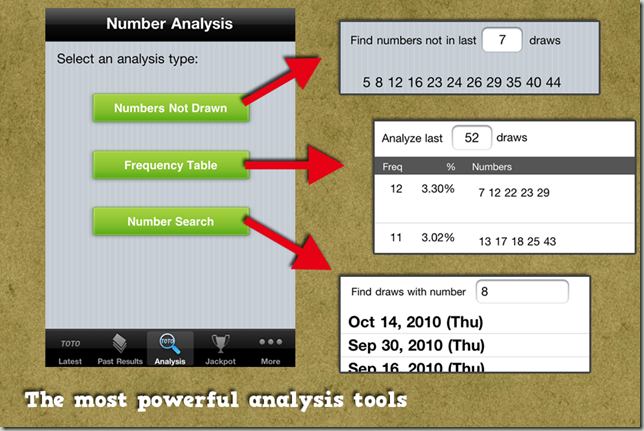 Again, unlike what Singapore Pools provides, the app gives you the freedom to analyze X draws. 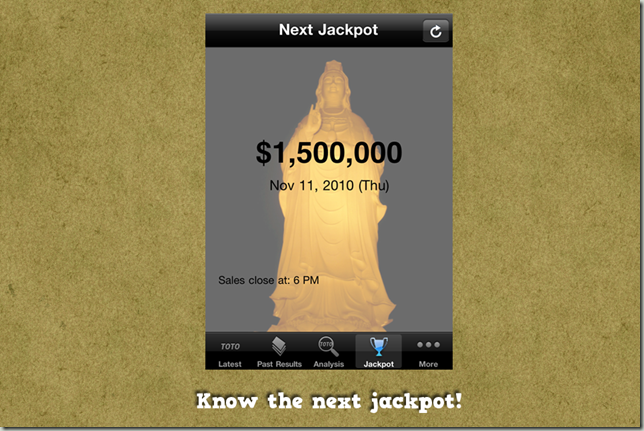 Furthermore, the app has data since 1986, while Singapore Pools only provide since 1997. 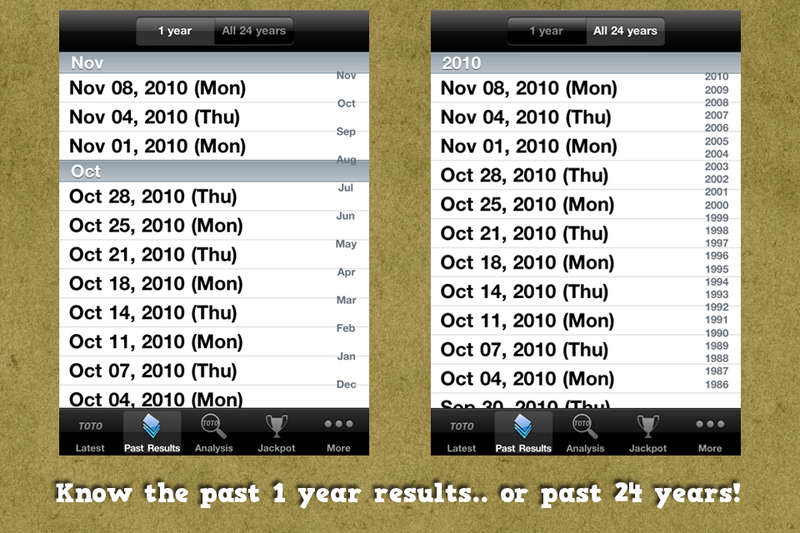 Search your favorite number and know when they last came out in a draw. Okay, version 1 had this too. 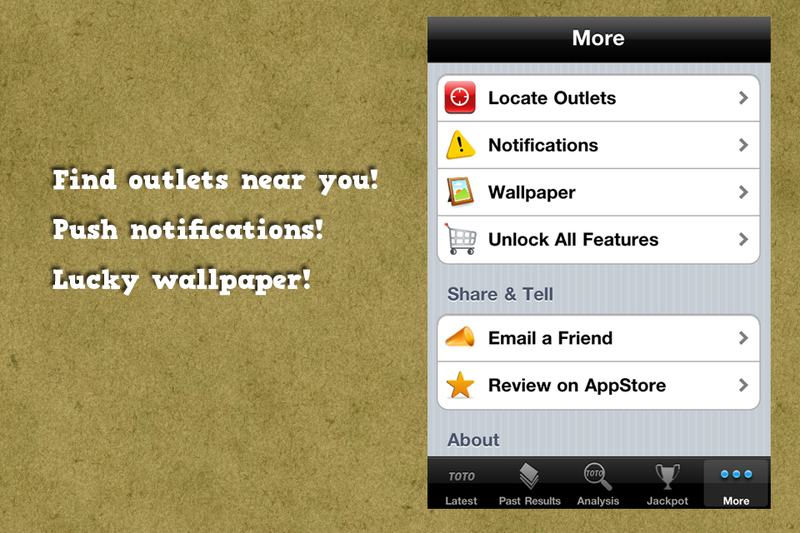 You can now find the outlets near you, get Push Notifications when results arrived, and set your lucky wallpaper! 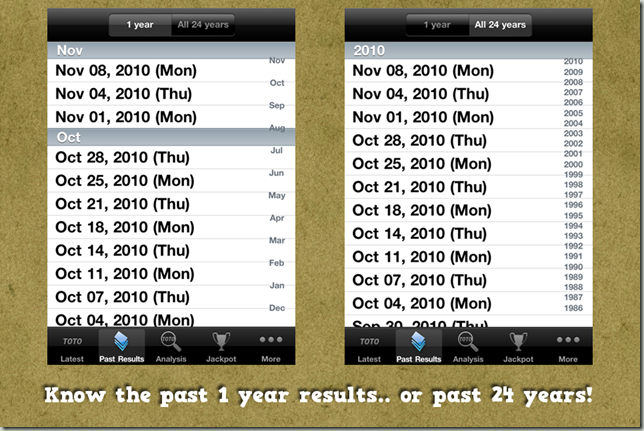 Lastly, we have updated the graphics and they now looks sharper and prettier for your iPhone 4. And the new icon for version 2.